These links tell the stories better than I can here. Watch the video - at least to the 2min 15sec mark. At least! We can Master Peace - together! Peace is a verb! The ideas shared at this link include issue of overcoming violence, by engaging forgiveness! Sometime in the fourth century Patrick, a sixteen year old boy, was captured and sold into slavery with a number of other Welsh people. Yep, he was Welsh. 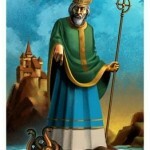 So Patrick’s first encounter with Ireland was not one of shamrocks, beer and drinking songs. It was actually an encounter with violence, conflict and for Patrick, suffering. It is a harsh introduction to the people for whom he would one day be remembered. Nevertheless, Patrick probably remained in slavery for 6 years or so before he escaped. He returned to his family in Wales and there entered the Church. Years later, after having been ordained bishop, he returned to the land of his enemies to serve them. Voluntarily. He went to genuinely, make peace in a place where he had know pain. While he may not have actually chased dangerous slithering reptiles off the island, there is a still a sense in which Patrick shows us how to drive out snakes from our lives. One doesn’t chase out dangerous little threats with Gandalf’s staff or a piper’s pipe. One has to change the whole ecosystem. Transformation is not simply taking dangerous things away but by introducing a new goods to fill a space with a different kind of life. Patrick turned great enmity into redemption. He refused to see his enemies as only that. He returned, literally, to a place of resentment specifically to offer new hope for that place and that people. He brought new life to chase out the would-be snakes of hatred and animosity. Patrick spent his life exorcising the little demons in his life and ended up tilting history. Wishing our world took seriously the exemplars of forgiveness we have had in our past, so that our future could be less violent and more peaceful. If we saw this kind of beauty everyday - we'd be inspired to make the world a better place - for all living things! Check the amazing landscape shots at 500px(dot)com ! "Sixteen Afghan civilians killed in rogue U.S. attack"
But, this U.S. attack is part of a deliberate program of extended violence! How then is the killing "rogue" except that we want to label it as something "other" than what American troops are doing all over Afghanistan each day? All of the violence in Afghanistan is, in fact, violent. All of the attacks are, in fact, attacks. When we permit sanctioned violence, other forms of violence begin to permeate from our midst. A better way can be found in peacemaking! Are you familiar with the Fetzer Institute? I've been aware of the Fetzer Institute for quite a number of years . . . but realized that perhaps some persons I know might not be aware of their work. In collaboration with our Fetzer Advisory Councils, we seek to understand the motivations and preconditions of exemplary cases of love and forgiveness in the world. From these examples, we develop projects to grow an even greater awareness of love and forgiveness in action in individual and community life. “It’s not a war. It’s a massacre, an indiscriminate massacre.” Chilling words from a photojournalist on the ground in Syria. “As I’m talking to you now, they’re dying.” Injured Sunday Times photographer Paul Conroy gives Sky News an interview from his hospital bed. This is a really important interview. His descriptions of what’s happening in Homs are painful and terrible. He spoke of the scheduled regularity of the shelling, beginning with horrible predictability at 6:00 every morning. I’ve worked in many war zones. I’ve never seen, or been, in shelling like this. It is a systematic … I’m an ex-artillery gunner so I can kind of follow the patterns… they’re systematically moving through neighborhoods with munitions that are used for battlefields. This is used in a couple of square kilometers. I actually want to quote his entire interview about the people who are living without hope, food, or power and his conviction that we will look back on this massacre with incredible shame if we stand by and do nothing. In lieu of that, you must must must watch every bit of this interview. Shared from "On Being" Public Radio Broadcast Blog Site.